Thrombin (EC 3.4.21.5, fibrinogenase, thrombase, thrombofort, topical, thrombin-C, tropostasin, activated blood-coagulation factor II, blood-coagulation factor IIa, factor IIa, E thrombin, beta-thrombin, gamma-thrombin) is a serine protease that, in humans, is encoded by the F2 gene. Prothrombin (coagulation factor II) is proteolytically cleaved to form thrombin in the coagulation cascade, the clotting process. Thrombin in turn acts as a serine protease that converts soluble fibrinogen into insoluble strands of fibrin, as well as catalyzing many other coagulation-related reactions. After the description of fibrinogen and fibrin, Alexander Schmidt hypothesised the existence of an enzyme that converts fibrinogen into fibrin in 1872. Thrombin is produced by the enzymatic cleavage of two sites on prothrombin by activated Factor X (Xa). The activity of factor Xa is greatly enhanced by binding to activated Factor V (Va), termed the prothrombinase complex. Prothrombin is produced in the liver and is co-translationally modified in a vitamin K-dependent reaction that converts ten glutamic acids on prothrombin to gamma-carboxyglutamic acid (Gla). In the presence of calcium, the Gla residues promote the binding of prothrombin to phospholipid bilayers. Deficiency of vitamin K or administration of the anticoagulant warfarin inhibits the production of gamma-carboxyglutamic acid residues, slowing the activation of the coagulation cascade. In human adults, the normal blood level of antithrombin activity has been measured to be around 1.1 units/mL. Newborn levels of thrombin steadily increase after birth to reach normal adult levels, from a level of around 0.5 units/mL 1 day after birth, to a level of around 0.9 units/mL after 6 months of life. In the blood coagulation pathway, thrombin acts to convert factor XI to XIa, VIII to VIIIa, V to Va, fibrinogen to fibrin, and XIII to XIIIa. Factor XIIIa is a transglutaminase that catalyzes the formation of covalent bonds between lysine and glutamine residues in fibrin. The covalent bonds increase the stability of the fibrin clot. Thrombin interacts with thrombomodulin. As part of its activity in the coagulation cascade, thrombin also promotes platelet activation and aggregation via activation of protease-activated receptors on the cell membrane of the platelet. Thrombin bound to thrombomodulin activates protein C, an inhibitor of the coagulation cascade. The activation of protein C is greatly enhanced following the binding of thrombin to thrombomodulin, an integral membrane protein expressed by endothelial cells. Activated protein C inactivates factors Va and VIIIa. Binding of activated protein C to protein S leads to a modest increase in its activity. Thrombin is also inactivated by antithrombin, a serine protease inhibitor. Anchoring of bovine prothrombin to the membrane through its Gla domain. 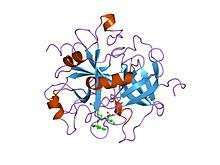 The molecular weight of prothrombin is approximately 72,000 Da. The catalytic domain is released from prothrombin fragment 1.2 to create the active enzyme thrombin, which has a molecular weight of 36,000 Da. Structurally, it is a member of the large PA clan of proteases. Prothrombin is composed of four domains; an N-terminal Gla domain, two kringle domains and a C-terminal trypsin-like serine protease domain. Factor Xa with factor V as a cofactor leads to cleavage of the Gla and two Kringle domains (forming together a fragment called fragment 1.2) and leave thrombin, consisting solely of the serine protease domain. As is the case for all serine proteases, prothrombin is converted to active thrombin by proteolysis of an internal peptide bond, exposing a new N-terminal Ile-NH3. The historic model of activation of serine proteases involves insertion of this newly formed N-terminus of the heavy chain into the β-barrel promoting the correct conformation of the catalytic residues. Contrary to crystal structures of active thrombin, hydrogen-deuterium exchange mass spectrometry studies indicate that this N-terminal Ile-NH3 does not become inserted into the β-barrel in the apo form of thrombin. However, binding of the active fragment of thrombomodulin appears to allosterically promote the active conformation of thrombin by inserting this N-terminal region. The thrombin (prothrombin) gene is located on the eleventh chromosome (11p11-q12). There are an estimated 30 people in the world that have been diagnosed with the congenital form of Factor II deficiency, which should not be confused with the prothrombin G20210A mutation, which is also called the factor II mutation. Prothrombin G20210A is congenital. Prothrombin G20210A is not usually accompanied by other factor mutations (i.e., the most common is factor V Leiden). The gene may be inherited heterozygous (1 pair), or much more rarely, homozygous (2 pairs), and is not related to gender or blood type. Homozygous mutations increase the risk of thrombosis more than heterozygous mutations, but the relative increased risk is not well documented. Other potential risks for thrombosis, such as oral contraceptives may be additive. The previously reported relationship of inflammatory bowel disease (i.e., Crohn's disease or ulcerative colitis) and prothrombin G20210A or factor V Leiden mutation have been contradicted by research. Activation of prothrombin is crucial in physiological and pathological coagulation. Various rare diseases involving prothrombin have been described (e.g., hypoprothrombinemia). Anti-prothrombin antibodies in autoimmune disease may be a factor in the formation of the lupus anticoagulant also known as (antiphospholipid syndrome). Hyperprothrombinemia can be caused by the G20210A mutation. Thrombin, a potent vasoconstrictor and mitogen, is implicated as a major factor in vasospasm following subarachnoid hemorrhage. Blood from a ruptured cerebral aneurysm clots around a cerebral artery, releasing thrombin. This can induce an acute and prolonged narrowing of the blood vessel, potentially resulting in cerebral ischemia and infarction (stroke). Beyond its key role in the dynamic process of thrombus formation, thrombin has a pronounced pro-inflammatory character, which may influence the onset and progression of atherosclerosis. Acting via its specific cell membrane receptors (protease activated receptors: PAR-1, PAR-3 and PAR-4), which are abundantly expressed in all arterial vessel wall constituents, thrombin has the potential to exert pro-atherogenic actions such as inflammation, leukocyte recruitment into the atherosclerotic plaque, enhanced oxidative stress, migration and proliferation of vascular smooth muscle cells, apoptosis and angiogenesis. Thrombin is implicated in the physiology of blood clots. Its presence indicates the existence of a clot. In 2013 a system for detecting the presence of thrombin was developed in mice. It combines peptide-coated iron oxide attached to "reporter chemicals". When a peptide binds to a thrombin molecule, the report is released and appears in the urine where it can be detected. Human testing has not been conducted. Due to its high proteolytic specificity, thrombin is a valuable biochemical tool. The thrombin cleavage site (Leu-Val-Pro-Arg-Gly-Ser) is commonly included in linker regions of recombinant fusion protein constructs. Following purification of the fusion protein, thrombin can be used to selectively cleave between the Arginine and Glycine residues of the cleavage site, effectively removing the purification tag from the protein of interest with a high degree of specificity. Prothrombin complex concentrate and fresh frozen plasma are prothrombin-rich coagulation factor preparations that can be used to correct deficiencies (usually due to medication) of prothrombin. Indications include intractable bleeding due to warfarin. 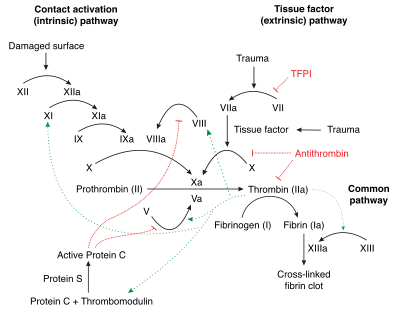 Manipulation of prothrombin is central to the mode of action of most anticoagulants. Warfarin and related drugs inhibit vitamin K-dependent carboxylation of several coagulation factors, including prothrombin. Heparin increases the affinity of antithrombin to thrombin (as well as factor Xa). The direct thrombin inhibitors, a newer class of medication, directly inhibit thrombin by binding to its active site. Recombinant thrombin is available as a powder for reconstitution into aqueous solution. It can be applied topically during surgery, as an aid to hemostasis. It can be useful for controlling minor bleeding from capillaries and small venules, but ineffective and not indicated for massive or brisk arterial bleeding. Thrombin is sold under the brand name Fibrimex for use as a binding agent for meat. 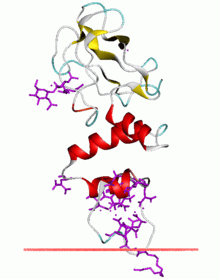 The thrombin in Fibrimex derives from porcine or bovine blood. According to the manufacturer it can be used to produce new kinds of mixed meats (for example combining beef and fish seamlessly). The manufacturer also states that it can be used to combine whole muscle meat, form and portion these thus cutting down on production costs without a loss in quality. General secretary Jan Bertoft of Swedish Consumers' Association has stated that "there is danger of misleading the consumers since there is no way to tell this reconstituted meat from real meat"
↑ "Drugs that physically interact with Prothrombin view/edit references on wikidata". 1 2 Royle NJ, Irwin DM, Koschinsky ML, MacGillivray RT, Hamerton JL (May 1987). "Human genes encoding prothrombin and ceruloplasmin map to 11p11-q12 and 3q21-24, respectively". Somatic Cell and Molecular Genetics. 13 (3): 285–92. doi:10.1007/BF01535211. PMID 3474786. ↑ Degen SJ, Davie EW (September 1987). "Nucleotide sequence of the gene for human prothrombin". Biochemistry. 26 (19): 6165–77. doi:10.1021/bi00393a033. PMID 2825773. ↑ Schmidt A (1872). "Neue Untersuchungen ueber die Fasserstoffesgerinnung". Pflüger's Archiv für die gesamte Physiologie. 6: 413–538. doi:10.1007/BF01612263. ↑ Andrew M, Paes B, Milner R, Johnston M, Mitchell L, Tollefsen DM, Powers P (July 1987). "Development of the human coagulation system in the full-term infant". Blood. 70 (1): 165–72. PMID 3593964. ↑ Bajzar L, Morser J, Nesheim M (July 1996). "TAFI, or plasma procarboxypeptidase B, couples the coagulation and fibrinolytic cascades through the thrombin-thrombomodulin complex". The Journal of Biological Chemistry. 271 (28): 16603–8. doi:10.1074/jbc.271.28.16603. PMID 8663147. ↑ Jakubowski HV, Owen WG (July 1989). "Macromolecular specificity determinants on thrombin for fibrinogen and thrombomodulin". The Journal of Biological Chemistry. 264 (19): 11117–21. PMID 2544585. ↑ PDB: 1nl2​; Huang M, Rigby AC, Morelli X, Grant MA, Huang G, Furie B, Seaton B, Furie BC (September 2003). "Structural basis of membrane binding by Gla domains of vitamin K-dependent proteins". Nature Structural Biology. 10 (9): 751–6. doi:10.1038/nsb971. PMID 12923575. ↑ Davie EW, Kulman JD (April 2006). "An overview of the structure and function of thrombin". Seminars in Thrombosis and Hemostasis. 32 Suppl 1: 3–15. doi:10.1055/s-2006-939550. PMID 16673262. ↑ Huber, Robert; Bode, Wolfram (1978-03-01). "Structural basis of the activation and action of trypsin". Accounts of Chemical Research. 11 (3): 114–122. doi:10.1021/ar50123a006. ISSN 0001-4842. ↑ Handley LD, Treuheit NA, Venkatesh VJ, Komives EA (November 2015). "Thrombomodulin Binding Selects the Catalytically Active Form of Thrombin". Biochemistry. 54 (43): 6650–8. doi:10.1021/acs.biochem.5b00825. PMC 4697735 . PMID 26468766. ↑ Degen SJ, McDowell SA, Sparks LM, Scharrer I (February 1995). "Prothrombin Frankfurt: a dysfunctional prothrombin characterized by substitution of Glu-466 by Ala". Thrombosis and Haemostasis. 73 (2): 203–9. PMID 7792730. ↑ Varga EA, Moll S (July 2004). "Cardiology patient pages. Prothrombin 20210 mutation (factor II mutation)". Circulation. 110 (3): e15–8. doi:10.1161/01.CIR.0000135582.53444.87. PMID 15262854. ↑ Bernstein CN, Sargent M, Vos HL, Rosendaal FR (February 2007). "Mutations in clotting factors and inflammatory bowel disease". The American Journal of Gastroenterology. 102 (2): 338–43. doi:10.1111/j.1572-0241.2006.00974.x. PMID 17156138. ↑ Borissoff JI, Spronk HM, Heeneman S, ten Cate H (June 2009). "Is thrombin a key player in the 'coagulation-atherogenesis' maze?". Cardiovascular Research. 82 (3): 392–403. doi:10.1093/cvr/cvp066. PMID 19228706. ↑ Borissoff JI, Heeneman S, Kilinç E, Kassák P, Van Oerle R, Winckers K, Govers-Riemslag JW, Hamulyák K, Hackeng TM, Daemen MJ, ten Cate H, Spronk HM (August 2010). "Early atherosclerosis exhibits an enhanced procoagulant state". Circulation. 122 (8): 821–30. doi:10.1161/CIRCULATIONAHA.109.907121. PMID 20697022. ↑ Borissoff JI, Spronk HM, ten Cate H (May 2011). "The hemostatic system as a modulator of atherosclerosis". The New England Journal of Medicine. 364 (18): 1746–60. doi:10.1056/NEJMra1011670. PMID 21542745. ↑ Economist (2013-11-05). "Nanomedicine: Particle physiology". The Economist. Retrieved 2013-12-15. ↑ Chapman WC, Singla N, Genyk Y, McNeil JW, Renkens KL, Reynolds TC, Murphy A, Weaver FA (August 2007). "A phase 3, randomized, double-blind comparative study of the efficacy and safety of topical recombinant human thrombin and bovine thrombin in surgical hemostasis". Journal of the American College of Surgeons. 205 (2): 256–65. doi:10.1016/j.jamcollsurg.2007.03.020. PMID 17660072. ↑ Singla NK, Ballard JL, Moneta G, Randleman CD, Renkens KL, Alexander WA (July 2009). "A phase 3b, open-label, single-group immunogenicity and safety study of topical recombinant thrombin in surgical hemostasis". Journal of the American College of Surgeons. 209 (1): 68–74. doi:10.1016/j.jamcollsurg.2009.03.016. PMID 19651065. ↑ Greenhalgh DG, Gamelli RL, Collins J, Sood R, Mozingo DW, Gray TE, Alexander WA (2009). "Recombinant thrombin: safety and immunogenicity in burn wound excision and grafting". Journal of Burn Care & Research. 30 (3): 371–9. doi:10.1097/BCR.0b013e3181a28979. PMID 19349898. 1 2 "Sverige röstade ja till köttklister" [Sweden voted in favor of the meat paste] (in Swedish). Dagens Nyheter. 2010-02-09. Retrieved 2010-10-17. ↑ "Welcome to Fibrimex". Fibrimex website. FX Technology. Retrieved 2010-10-17. Esmon CT (July 1995). "Thrombomodulin as a model of molecular mechanisms that modulate protease specificity and function at the vessel surface". FASEB Journal. 9 (10): 946–55. PMID 7615164. Wu H, Zhang Z, Li Y, Zhao R, Li H, Song Y, Qi J, Wang J (October 2010). "Time course of upregulation of inflammatory mediators in the hemorrhagic brain in rats: correlation with brain edema". Neurochemistry International. 57 (3): 248–53. doi:10.1016/j.neuint.2010.06.002. PMID 20541575. Lenting PJ, van Mourik JA, Mertens K (December 1998). "The life cycle of coagulation factor VIII in view of its structure and function". Blood. 92 (11): 3983–96. PMID 9834200. Plow EF, Cierniewski CS, Xiao Z, Haas TA, Byzova TV (July 2001). "AlphaIIbbeta3 and its antagonism at the new millennium". Thrombosis and Haemostasis. 86 (1): 34–40. PMID 11487023. Maragoudakis ME, Tsopanoglou NE, Andriopoulou P (April 2002). "Mechanism of thrombin-induced angiogenesis". Biochemical Society Transactions. 30 (2): 173–7. doi:10.1042/BST0300173. PMID 12023846. Howell DC, Laurent GJ, Chambers RC (April 2002). "Role of thrombin and its major cellular receptor, protease-activated receptor-1, in pulmonary fibrosis". Biochemical Society Transactions. 30 (2): 211–6. doi:10.1042/BST0300211. PMID 12023853. Firth SM, Baxter RC (December 2002). "Cellular actions of the insulin-like growth factor binding proteins". Endocrine Reviews. 23 (6): 824–54. doi:10.1210/er.2001-0033. PMID 12466191. Minami T, Sugiyama A, Wu SQ, Abid R, Kodama T, Aird WC (January 2004). "Thrombin and phenotypic modulation of the endothelium". Arteriosclerosis, Thrombosis, and Vascular Biology. 24 (1): 41–53. doi:10.1161/01.ATV.0000099880.09014.7D. PMID 14551154. De Cristofaro R, De Candia E (June 2003). "Thrombin domains: structure, function and interaction with platelet receptors". Journal of Thrombosis and Thrombolysis. 15 (3): 151–63. doi:10.1023/B:THRO.0000011370.80989.7b. PMID 14739624. Tsopanoglou NE, Maragoudakis ME (February 2004). "Role of thrombin in angiogenesis and tumor progression". Seminars in Thrombosis and Hemostasis. 30 (1): 63–9. doi:10.1055/s-2004-822971. PMID 15034798. Bode W (2007). "Structure and interaction modes of thrombin". Blood Cells, Molecules & Diseases. 36 (2): 122–30. doi:10.1016/j.bcmd.2005.12.027. PMID 16480903. Wolberg AS (May 2007). "Thrombin generation and fibrin clot structure". Blood Reviews. 21 (3): 131–42. doi:10.1016/j.blre.2006.11.001. PMID 17208341. 1c4u: SELECTIVE NON ELECTROPHILIC THROMBIN INHIBITORS WITH CYCLOHEXYL MOIETIES. 1c4v: SELECTIVE NON ELECTROPHILIC THROMBIN INHIBITORS WITH CYCLOHEXYL MOIETIES. 1h8d: X-RAY STRUCTURE OF THE HUMAN ALPHA-THROMBIN COMPLEX WITH A TRIPEPTIDE PHOSPHONATE INHIBITOR. 1h8i: X-RAY CRYSTAL STRUCTURE OF HUMAN ALPHA-THROMBIN WITH A TRIPEPTIDE PHOSPHONATE INHIBITOR. 1no9: Design of weakly basic thrombin inhibitors incorporating novel P1 binding functions: molecular and X-ray crystallographic studies. 2jh0: HUMAN THROMBIN HIRUGEN INHIBITOR COMPLEX. 2jh5: HUMAN THROMBIN HIRUGEN INHIBITOR COMPLEX. 2jh6: HUMAN THROMBIN HIRUGEN INHIBITOR COMPLEX. 2od3: Human thrombin chimera with human residues 184a, 186, 186a, 186b, 186c and 222 replaced by murine thrombin equivalents. 4thn: THE CRYSTAL STRUCTURE OF ALPHA-THROMBIN-HIRUNORM IV COMPLEX REVEALS A NOVEL SPECIFICITY SITE RECOGNITION MODE. 7kme: CRYSTAL STRUCTURE OF HUMAN ALPHA-THROMBIN INHIBITED WITH SEL2711. 8kme: CRYSTAL STRUCTURE OF HUMAN ALPHA-THROMBIN INHIBITED WITH SEL2770.